Monotype have added a feature to their fonts.com web font service, giving subscribers the option to host fonts on their own server. This feature was previously only available to customers who purchased extended Web Fonts Services licensing, but now anyone with a Professional account can opt to self-host. 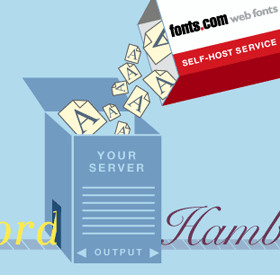 In addition to the traditional font embedding methods subscribers can download a self-hosting kit containing their typefaces in various formats, ready to deploy to their web server. When Typekit launched in 2009 one of the reservations I expressed about subscription web font services was their reliance on Content Distribution Networks (CDNs), which introduce a potential point of failure. I’ve not had any problems with fonts.com’s CDN, but self-hosting is apparently one of their most requested features, so it’s good to hear that it’s now an option. MyFonts already allow customers to self-host their web fonts, and it will be interesting to see if other font venders follow suit. It is worth noting that self-hosting requires a $100/month Professional fonts.com subscription, which is more than many web designers would be willing to pay. Nevertheless this is still big news for existing Professional subscribers. Read more about the new self-hosting option on the fonts.com blog.